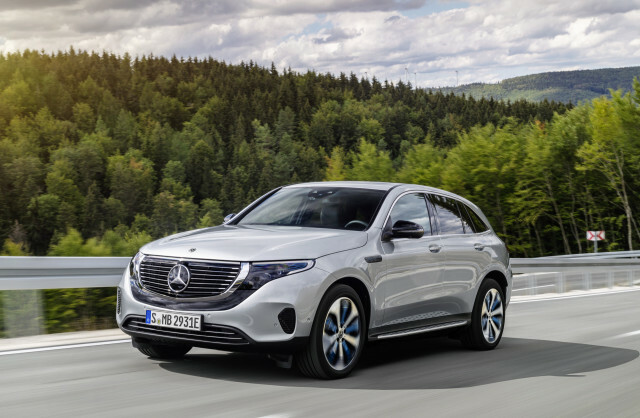 The Mercedes-Benz EQC is the automaker's first all-electric crossover SUV and the first popular vehicle to launch its EQ sub-brand for electric vehicles. It made its debut in 2016 as a concept vehicle but took until 2018 to make its first appearance as a production-ready vehicle. The Mercedes-Benz EQC will go on sale first in Norway in 2019 and will arrive in North America in 2020. The EQC is powered by an 80-kwh battery and returns a range of more than 200 miles, according to the automaker. With the EQC, Mercedes-Benz has a rival for electric crossovers such as the Jaguar I-Pace, Tesla Model X, BWM iX3, Audi E-tron, and Porsche Taycan. The Mercedes-Benz EQC is instantly at home in the automaker's lineup of utility vehicles that includes the GLC-Class and GLE-Class. The EQC will be built alongside the GLC-Class but will be 4 inches longer than the crossover SUV and coupe. The EQC should offer more interior room than both thanks to batteries below the floor, and Mercedes says the electric crossover comfortably seats five. Styling for the EQC largely follows Mercedes-Benz's language in profile, but not in the details. The front grille is unique to the EQC and equipped as standard with a light-up three-pointed star and a long, horizontal light band that reaches across the face and atop the panel black grille. Its LED headlights are a signature element for the EQC and frame a low-slung maw that reaches down toward the road in a broad swoop. Along the sides, the EQC's roofline splits the difference between the tall GLC and dramatically styled GLC Coupe, however. The EQC isn't as techno-styled as the I-Pace or the E-Tron, eschewing dramatic shapes in favor of a tried-and-true profile. 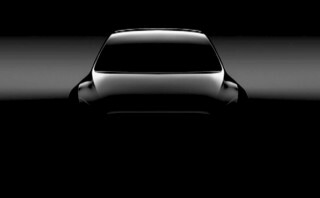 In back, a chrome strip along the bottom somewhat mimics tailpipes, while a long strip of LED taillights spans the rear hatch. The EQC will sport an "EQC 400" badge on the back that signifies its position in the broader Mercedes-Benz lineup for power, although it's not directly related to the crossover's 402-horsepower output. To summon that power, the EQC relies on two electric motors at each axle for power. The front motor handles low- to medium-speed acceleration for better efficiency, the rear motor kicks in more for a rear-feeling power bias and more speed. Combined, the motors generate 564 pound-feet of torque. According to Mercedes, the EQC will be equipped with a 7.4-kw onboard charger and handle up to 110 kw at appropriately equipped fast chargers. Mercedes estimates that the battery can charge up to 80 percent in 40 minutes on a fast charger, although the automaker didn't specify how long it would take to fully charge on a Level 2 charger that are more typically found at home. The EQC will be available in several trims including an AMG Line and an Electric Art line, each with their own unique accents. Mercedes hasn't yet how much the EQC will cost when it goes on sale.